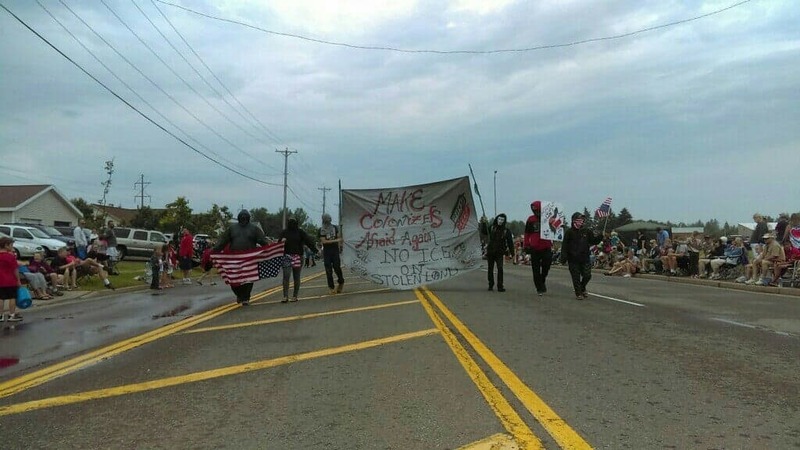 Yesterday on July 4th, the kkkolony of Superior Wisconsin and Duluth Minnesota/Occupied Ojibwe and Dakota territory wished to celebrate the genocide of indigenous nations openly with a parade, concert and public display of debauchery, inebriation and systematic racism while perpetuating the erasure of indigenous nations local to the territory, while the imprisonment and deportation of our indigenous allies north and south of their imaginary borders continues, in conjunction with an open display of ignorance that they are on Stolen Land. Midday an impromptu anti-colonial occupation of the Minnesota Power Plaza ensued, complete with a hot meal to be shared with community members, in the spirit of creating a public autonomous anti-colonial themed space on this wretched day in history. Immediately following the occupation our crew grew as we mobbed up to the capitalist and kkkolonial festivities in the form of carnival rides and music. 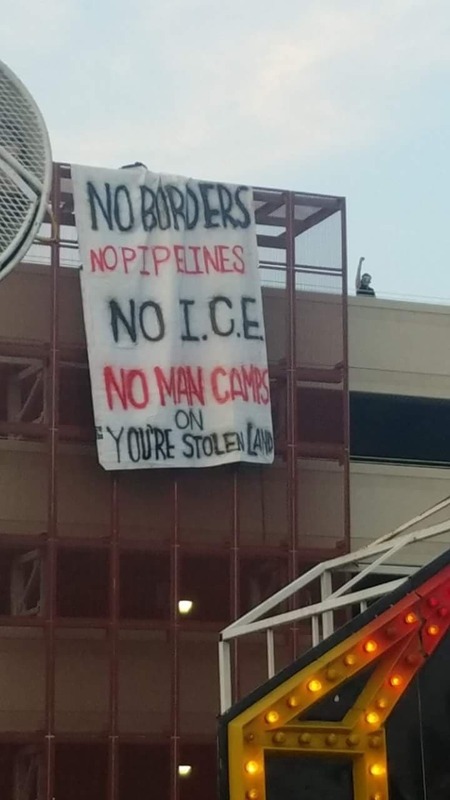 A banner was dropped from the parking garage overlooking it all reading, “NO BORDERS, NO PIPELINES, NO MAN CAMPS, NO I.C.E., YOU’RE ON STOLEN LAND”. The local crowd cheered as police and private security scrambled to dismantle the rhetoric hanging before the eyes of their consumer populous. As evening descended, the crew dispersed in various directions to play, “capture the flag,” and de-clothe the city of their symbol of patriotism, colonialism, racism and patriarchy, the “amerikkkan flag,” that will never and has never represented the indigenous territories on Turtle Island; several flags were captured and destroyed or saved for strategic demolition. As indigenous and non-indigenous anarchists alike we support yesterdays actions of a POC individual who chose to literally Rise and Resist this fascist regime by climbing the statue of liberty; furthermore, we do not support the initial public denunciation of this individual and their actions by their supposed “comrades” in the “Rise and Resist” organization. Dissent should be kept internal to the struggle, as our collective enemies feed the flames of conflict in our various crews that should be struggling alongside each other, not against each other. All colonies are burning; set the fire in your local community today, as the only way to cure the new-rise-to-fascism problem in “Trump’s America,” is to burn his concepts to the ground and continue to create the communities in which we want to see and live. All Fires Are Sacred. In solidarity with all comrades struggling against a white supremacist fascist regime!